There is a product missing in my local supermarket. Being a man it’s damn hard to buy washing agent without feeling embarrassed. Most of the products have a female or at best a neuter-like look. It’s almost like shopping for lingerie and I guess there is a clear demand for a masculine washing agent – so let’s give the market what it yearns for. At first, let’s have a look at our product: well, it’s soap. Okay, we’ll add some of these funny optically brightening chemicals, for we want everything brutally bright and shiny, but it’s essentially just soap. Nevertheless, I think we can put the price a bit above the average washing agent, since it’s (nearly) always more expensive to be a man (=big spender). Plus we’ll donate 1€ for each sold package to the army under the condition, that the money donated must be spent on new weapons (thinking of this, it would be cool to get the army laundries to use our product, so that we could put a big fat “official supplier of YourNationalArmedForcesHere” button on the package). Initially the product should be sold at tool stores, sports shops, etc. – you get the idea. Now that we have a rough idea of our business, let’s give our product a name. It needs to communicate uncompromising power or better: that it will empower the customer to the max. And remember: men don’t want to talk about problems (=washing), we want them solved (=clean). A subtle yet effective possibility to get this across would be to call the product “NUKE”. Let’s take a bold typo and put a nice image of a nuclear detonation behind it and voilá: we got a logo. Okay it’s still a bit too illustrative, but it works fine as a first draft. Maybe we could add something like “for gammaflashingly clean laundry” later on. The next thing we need is appropriate packaging. The soft feminine forms of the typical washing agent are, of course, no option. 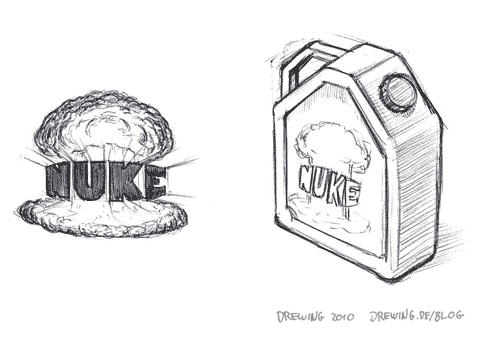 Thinking of liquid nuke, we need it to look like something men are used to. Something that feels just right if you take it from the shelf and put it on the counter. At first a kind of rocket- or bomb-like package could be an idea, but this would be too far from the real thing (i.e. the weapon) and would look rather silly, like a toy. A metal case would be cool containing different components, that need to be combined just before the washing. But this would be fun only for the first time – afterwards it would soon start to be annoying.